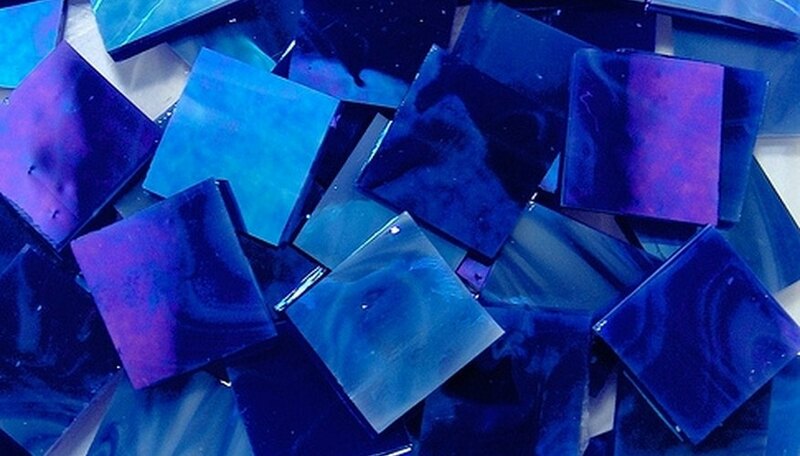 Glass is a great material for creating fun and practical crafts. Whether it is obtained from picture frames, windows, wine bottles or glass jars, there are dozens of neat uses for your leftover glass. When working with broken glass, be sure to employ safe handling practices. A terrarium is a miniature habitat, often filled with plants, insects or small animals, typically contained within a glass structure such as a fish bowl or aquarium. If you have a medium to large glass jar, you can create your own terrarium. Choose from a dry, jungle-like or wooded habitat. Then collect the materials from your yard or purchase from your local nursery. Include pebbles, wood chips, leaves, soil and moss, as well as a small plant, insect, or animal, such as a lizard or frog. If including an animal, be sure that you have an adequate water supply and that your soil is free of chemicals. If you lack a green thumb, an alternative craft is to make a faux terrarium using fake plants. Instead of sliding a photo into your picture frame, use the glass within your frame to create a fun and easy glass craft. To create your glass frame, you will need to purchase glass paints from your local craft store. Remove the glass piece from your frame and wash thoroughly. Once your glass is completely dry, use the glass paint to create your designs. If you aren't particularly artistic, peruse the Internet for stencils or images. Print out an image and lay it underneath your piece of glass. Using your paints, you can then trace the outline of your image. Once your artwork is dry, you can reframe the glass. If you have two even pieces of glass, another craft idea is to flatten a flower between the two and insert them back into the frame. Glass is a wonderful material for creating mosaics, which are images or works of art composed of a number of pieces of colored glass, stones or other material. To create a mosaic, you will need a mold, such as a cake pan, small pieces of glass, grout, mortar, damp sponge, petroleum jelly, safety gloves and goggles. Wearing gloves and goggles, smash various colored bottles or jars to create pieces of small colored glass. Make sure to keep the colors separated. Lube up your mold. Layer your mold with mortar. Then gently push your glass pieces into the mortar to form your design. Let dry (refer to the label on your mortar for drying time). Using a craft stick, force grout between each piece of glass. Using a damp sponge, remove any excess grout. Let dry. Once your mosaic is dry, carefully remove from cake pan by turning it upside down. You can paint the edges. Decorative wine bottles make wonderful glass crafts that can be used around the home. An easy and simple glass craft involves using your favorite wine bottles as candle holders. For this craft, you'll need taper candles and a surface to put under your wine bottle, such as a saucer or large coaster, to catch the melted wax. Simply insert a tapered candle into your wine bottle and then place it near your fireplace or on a table. If you've got a shortage of vases, convert empty beer and glass bottles into instant vases. If you like the label, keep it. Otherwise, peel it off or cover it with a label of your own. Print out a favorite photo from your last nature hike or garden and affix it to your vase.